This is a brand new load of Knoll Dividends cubicles located in our Dallas warehouse. These cubicles are 7.5′ x 7.5′ and are 50″ tall. 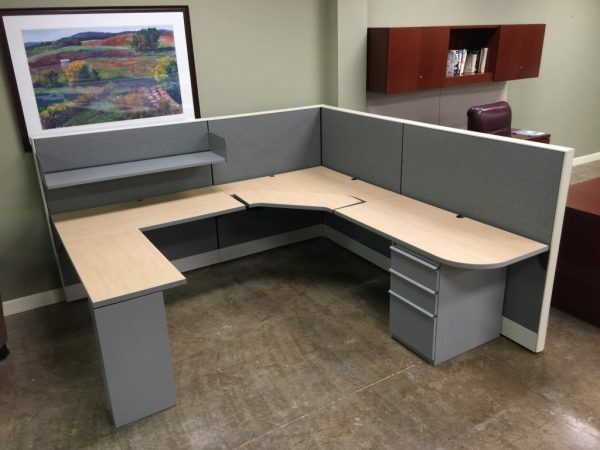 Each cubicle comes with a u-space desk and adjustable corner work surface, one box box file and one open shelf. The colors provided with these cubicles create an open feel throughout your workplace while the low walls allow more light to penetrate the space. Knoll Cubicles are a high end brand of cubicle known for their designer friendly color selections and unique layout options. These cubicles, when bought new, would have been over $3,000 each. If you are interested in these cubicles please chat online today or fill out the contact form.